We will capture beautiful views of any given place with the clearest technology of the industry. Our Virtual Tours come in a very attractive package, prepared for the highest marketable exposure. We use a special software to display them on the internet. This software is "State of the Art" and full of rich features. 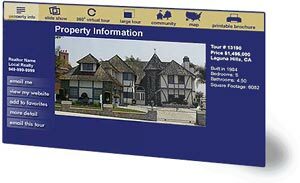 1) You will display your tours on line on a very attractive masking. copied many times over for private distribution. 5)Once you place your order, we send a photographer within 24-48 hours! . 6) Record Time Delivery: After our Photographer took the pictures, we make delivery effective in a record time of 24-48 hours! That Quick!